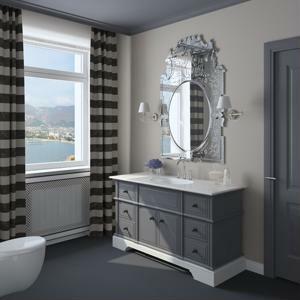 While you may be sifting through your many options of bathroom vanities, bathroom accessories and other accents, your color scheme is quite possibly the most important facet of the room's layout. According to Better Homes and Gardens, gray and white go together far easier than you may expect and the combination will give you an opportunity to incorporate plenty of contemporary additions. Wainscoting is one of the easiest ways to provide equal proportions of color throughout the space. Whether you're using wood or marble, white wainscoting around the room will allow you to paint the rest of the walls gray and improve the use of light in the space. One of the greatest advantages of this color scheme is that each colorful accent will be doubly impressive. Your artwork and line choices will look far more attractive against the neutral backdrop. Finish the look of the space by using brushed nickel or chrome fixtures - this will help balance the crisp white and matte gray with a dose of metallic shine. A neutral color palette like this can dramatically open up your style choices and create a bathroom that's adaptable to any season. What decorative tips do you have for homeowners who are looking to incorporate a gray and white color scheme?